Fukushima City was not evacuated after the disaster at the Fukushima Daiichi nuclear power plant after the earthquake and tsunami in 2011. It is the prefectural capital with a population of more than 280,000. On the surface, life appears to continue here as normal. We met with Shuji Akagi, an artist and high school art teacher, who lives in the city (Shuji’s work was shown in the Actinium exhibition and he spoke at the forum). Since 2011, Shuji has been meticulously photographically documenting the decontamination of the city. He took us on a tour of the city to give us some insight into this vast process, which involves the rather low-tech process of scrubbing roads, buildings and trees with street sweeping vehicles, high-powered sprayers, and hand-held brushes. In addition, the first metre of topsoil is being removed from parks and gardens and reburied elsewhere. The plan is to decontaminate the entire city. It has taken three years so far and it looks a long way from being finished. The photo below is of one of the temporary storage sites for contaminated topsoil in the heart of this busy city. 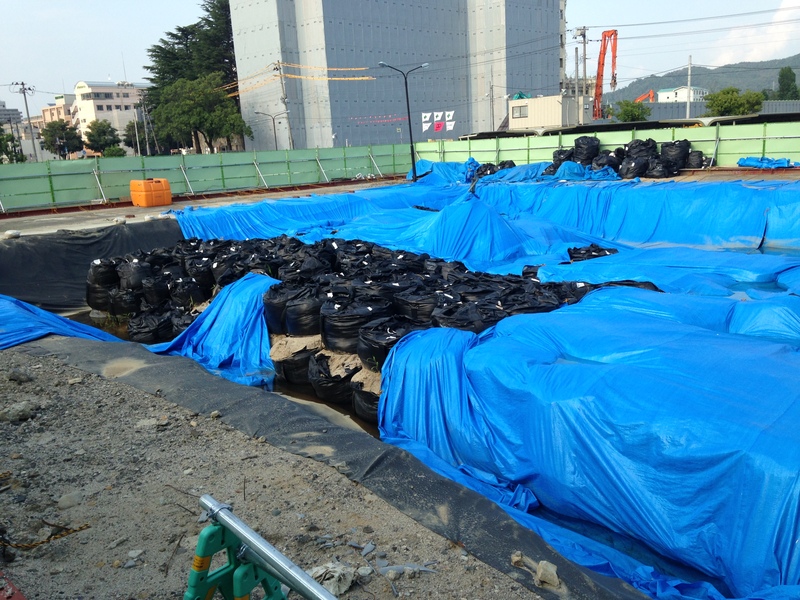 Hidden from street view behind a fence, here they are storing topsoil, which will then be reburied elsewhere in Fukushima prefecture. The city has difficulty finding storage sites to keep contaminated soil. When first removed, it is temporarily stored on the premises of schools and people’s homes, buried in yards or covered in plastic sheets, awaiting collection. All around the city, you see these piles of contaminated topsoil. 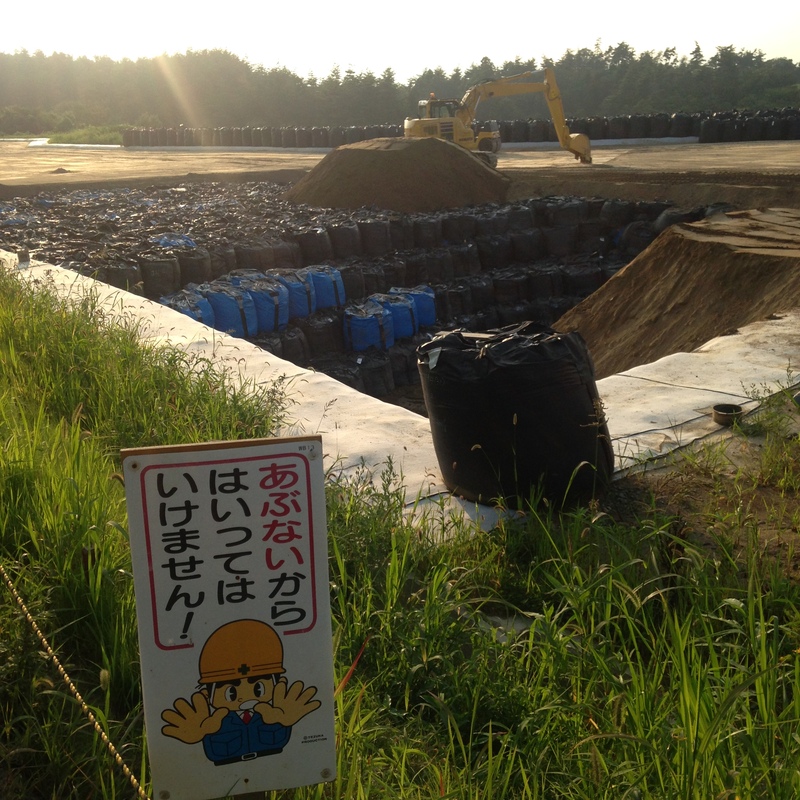 Shuji took us to see a large temporary storage site, where this topsoil is then taken, just on the edge of the city by Fukushima University. The topsoil is stored here before being relocated again for burial. How do the people of the city feel about the decontamination? Do they discuss its progress? Do they think it is effective? 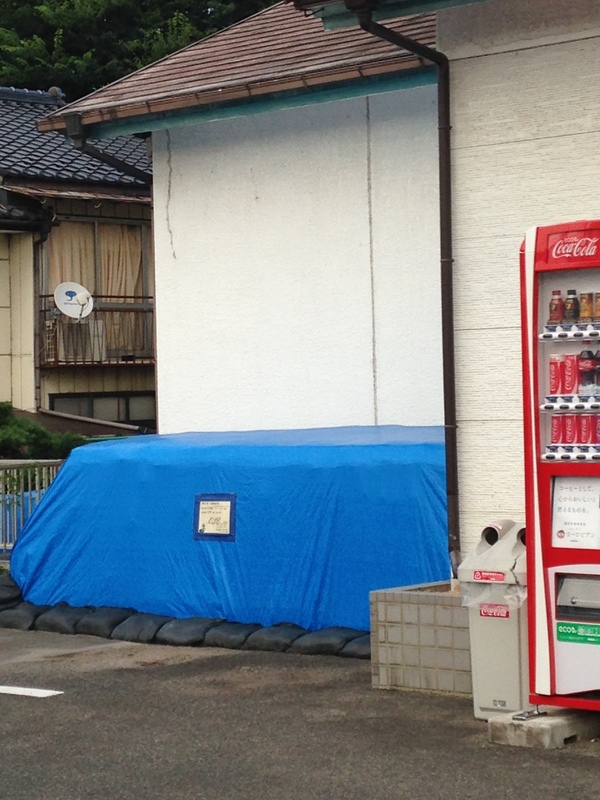 Shuji told us that it is rarely discussed by the city’s inhabitants in general conversation. The city authorities say the city is safe and the city returned quite quickly to normal after the disaster, almost as though nothing had happened. He finds this very strange. But he does not know if he is too worried, or not worried enough, about the dangers posed by the contamination. He knows he looks for spots of high radiation, while others prefer to be reassured, and he finds it difficult to find others in the city as concerned as he is. The art world outside Fukushima and internationally, where his photographs are widely exhibited, gives him an arena to discuss the things that concern him so greatly that he relocated his family to another city, 80 km away, although he still works in Fukushima City to keep up their income. 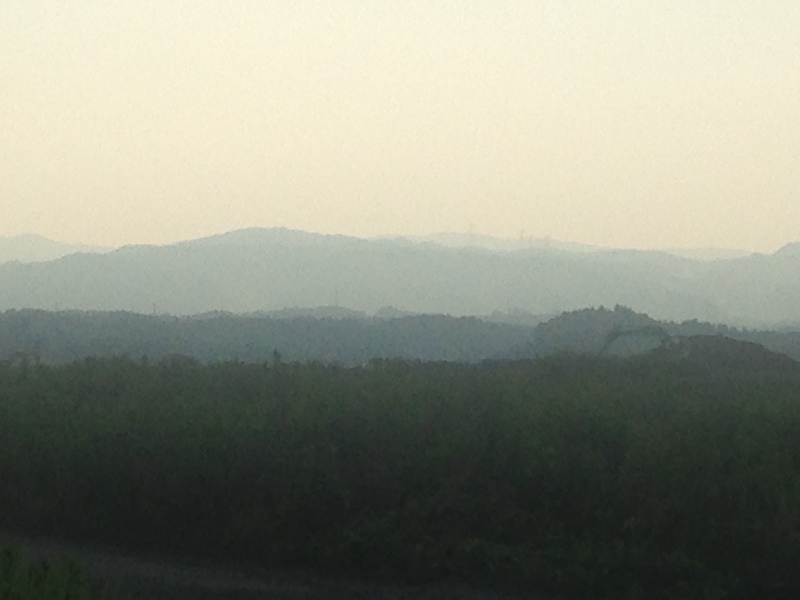 From Fukushima City, our group drove to Soma, closer to the Fukushima restricted zone, where we stayed the night. 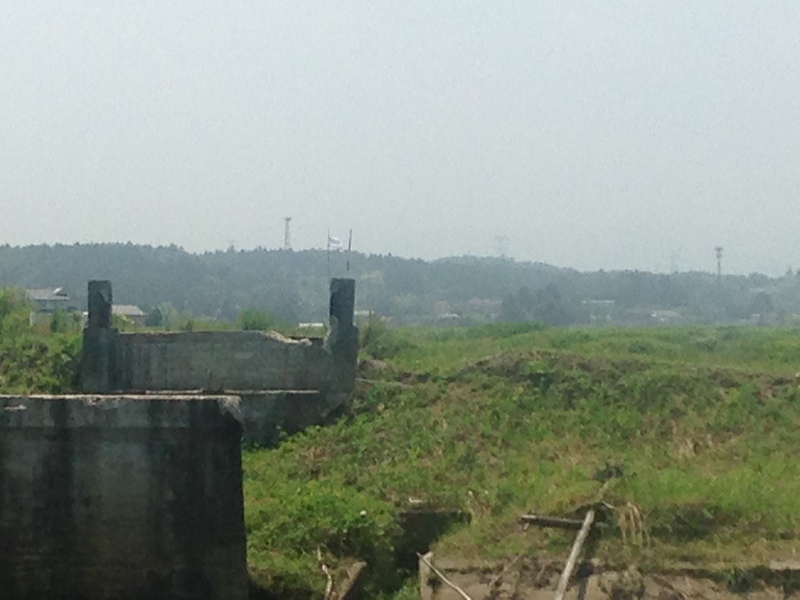 Shuji accompanied us, interested to visit the evacuation zone around the power plant. In the early hours, the hotel shook. An earthquake. A small one for here. A common occurrence. 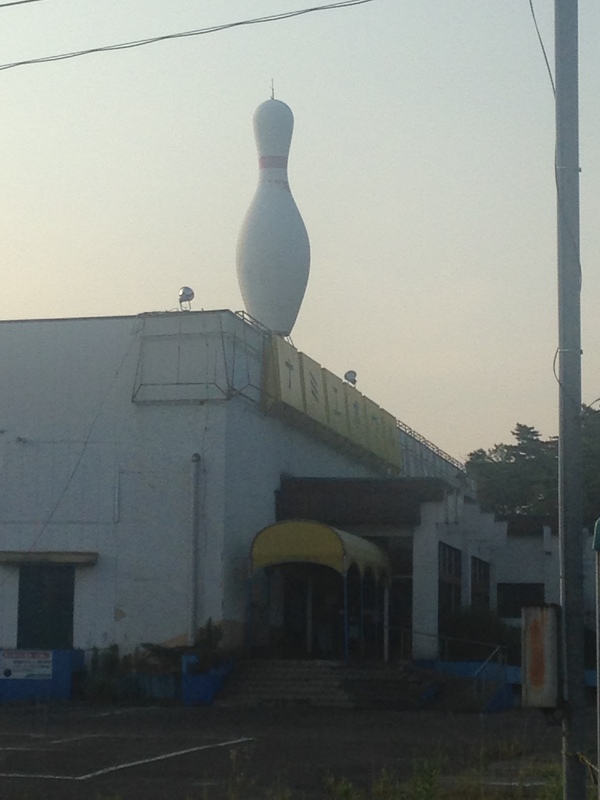 And this is where they build nuclear reactors? This feels increasingly uncanny, a place where abnormal things have become normalised. 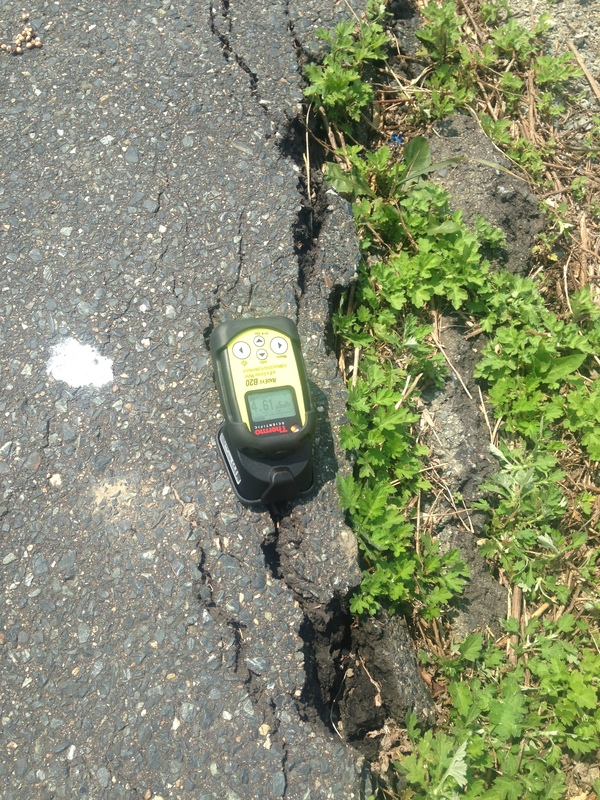 It is complex to explain the spatial aspect of the exclusion and restricted zones around Fukushima. This is one map I’ve found that can help, and it usefully shows the location of Fukushima City. 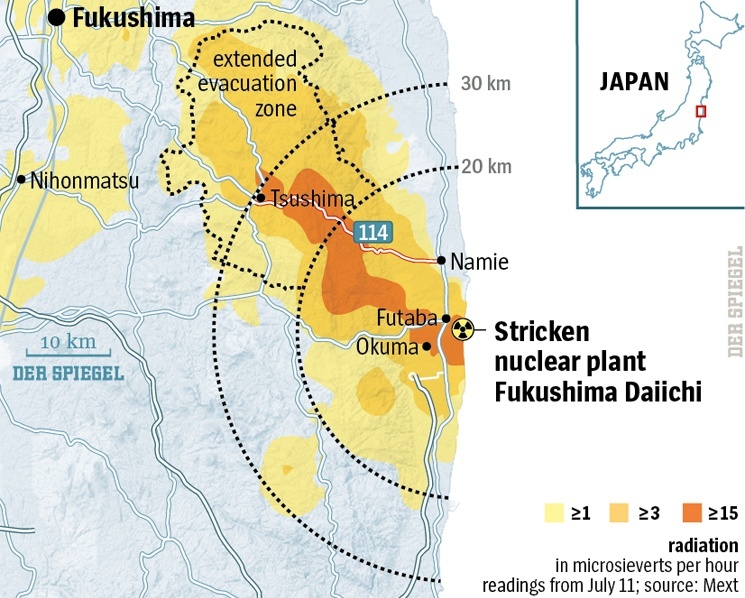 Initially, the exclusion (evacuation) zone was a 20km circle around the around the Fukushima Daiichi plant – shown on the map below. However, the coloured areas show how the radiation was actually distributed, due to the wind direction. 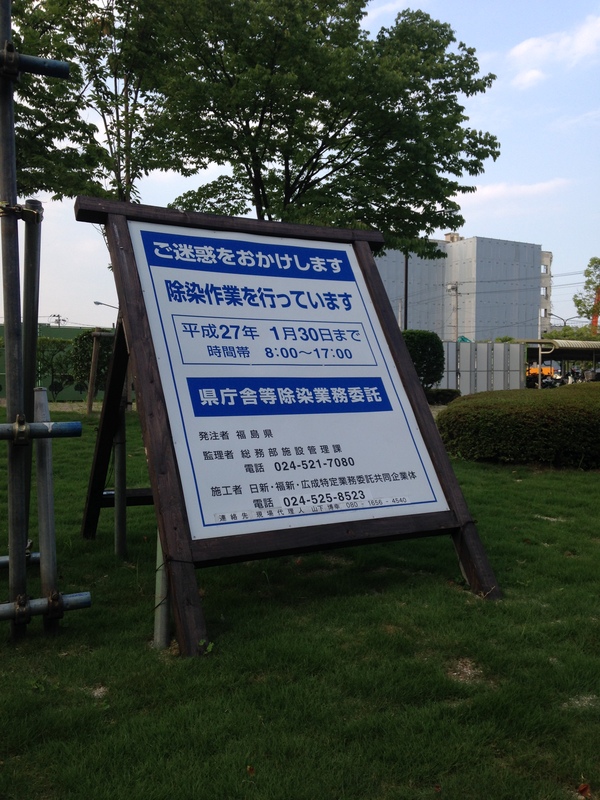 This meant that the original evacuation zone was soon extended Northwest towards Fukushima City, although the city itself was left outside it. The restricted zone today continues to be adjusted to allow people into areas with lower radiation levels, and move them out of areas with higher levels. Below is a recent, although by no means up-to-date, map. The green areas show those parts of the original exclusion zone that people are now allowed back into. The orange are areas where people are only allowed in during the day to work or visit former homes, but cannot live there, or which can only be visited at all with a special permit. The pink area is the Red Zone, the most contaminated area, which is extremely restricted. 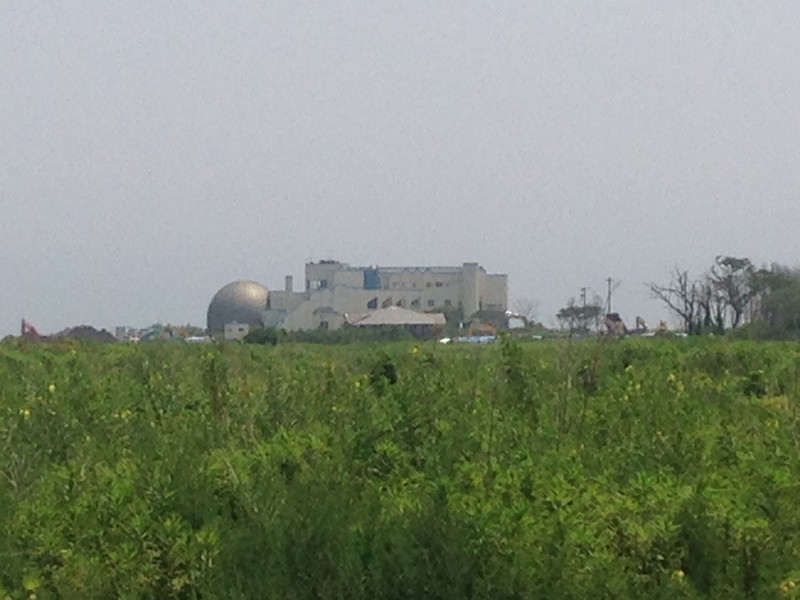 Due to the revised shape of the exclusion zone, by driving down Highway 6 from Soma, and with a special permit, we were able to come within 4km of the Daiichi power plant itself and to visit the evacuated town of Namie. The morning after our bumpy sleep, we set off with Shuji and a local guide (a former farmer, evacuated from his house in the exclusion zone, who stays in the area working with an NGO). Driving along Highway 6, we found ourselves tailing one of the many trucks carrying radioactive topsoil. It’s a massive industry here, the clean up. We stopped in Minamisoma (a formerly evacuated city to which inhabitants have been allowed to return) to pick up our permit, allowing us to enter the Orange Zone. 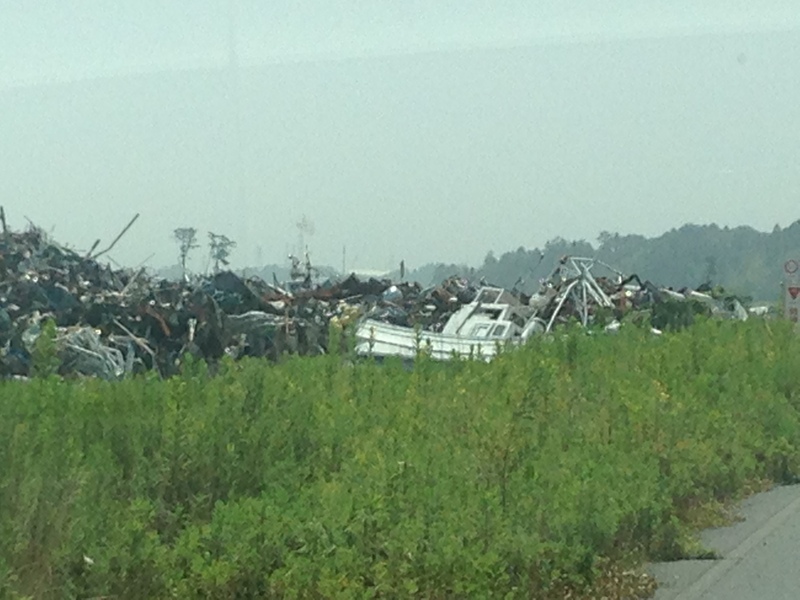 Our guide took us to the coastal area where he lived to the north of the Daiichi plant. 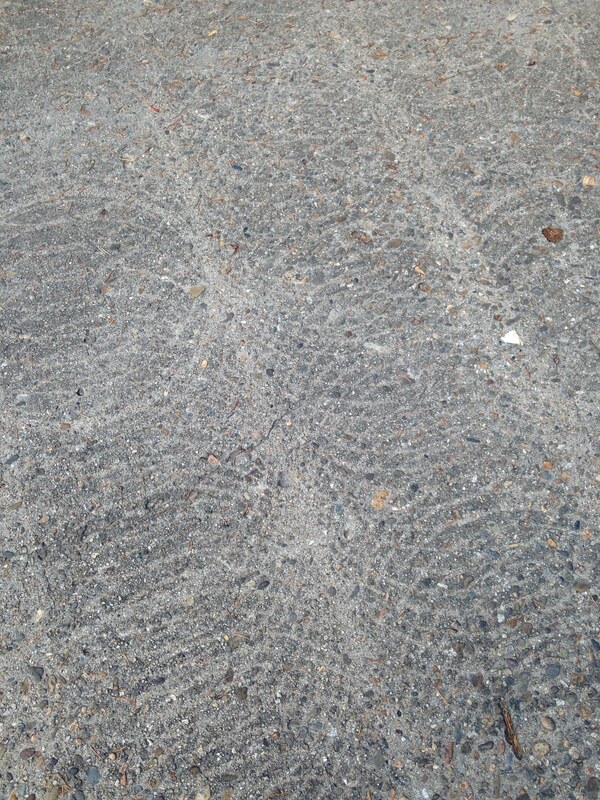 In most of the area affected by the tsunami, the clean up has erased most obvious physical evidence. Here, the physical evidence of the tsunami is frozen in time, a consequence of the radioactivity that has fallen on the area. 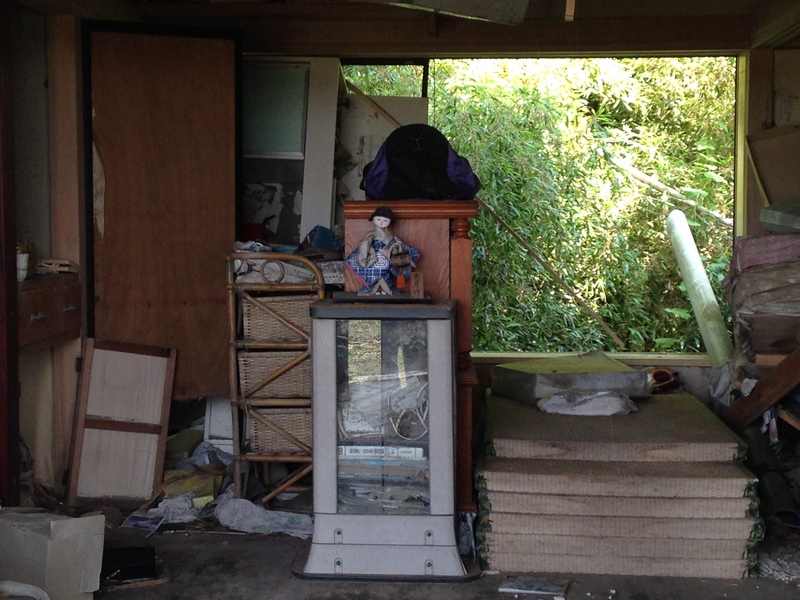 “Here most people got out” our guide says as we reached some derelict houses. 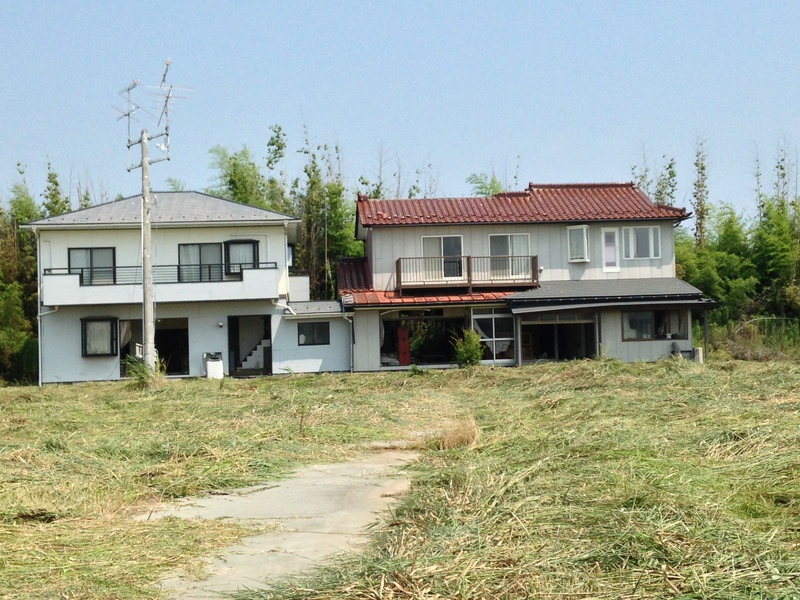 “Here, over 100 people died”, he informed us, as we passed an area where there was no trace of any houses – washed away by the force of the tsunami. Passing the checkpoint at which we showed our permit, we arrived at the edge of the Red Zone. Getting out of our minivan, we could just make out Fukushima Daiichi’s plant’s reactors, 4 km away, across a river with a broken bridge. Ele Carpenter took her Geiger counter out and placed it close to the water source (where radioactivity concentrates). The readings on the counter had increased as we’d got closer to the Red Zone, but not significantly. 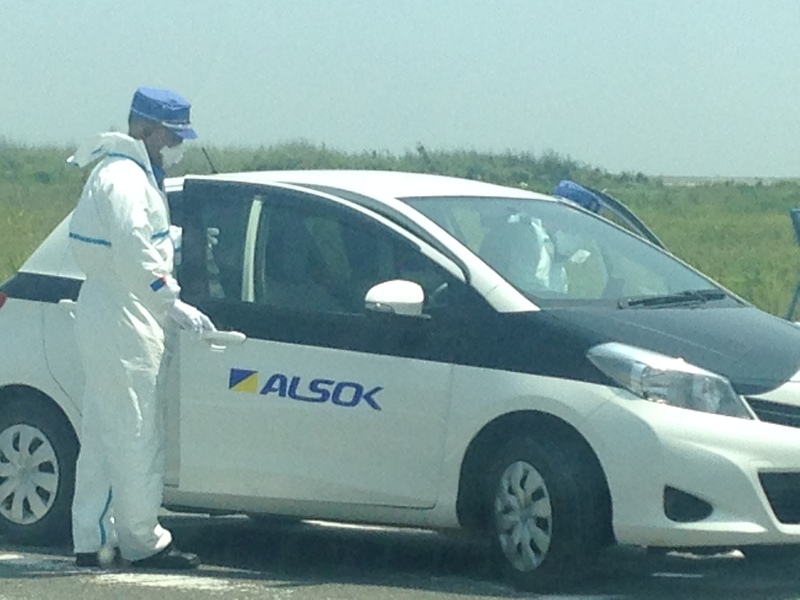 As we looked out across the landscape, a pair of workers emerged by car from the Red Zone wearing white suits. This was the first sign we had seen of anyone in protective wear. Bizarrely, a Google streetcar passed us as we stood there. Will we be on Google Street View, captured hanging around uncertainly in this uncertain uncanny zone? 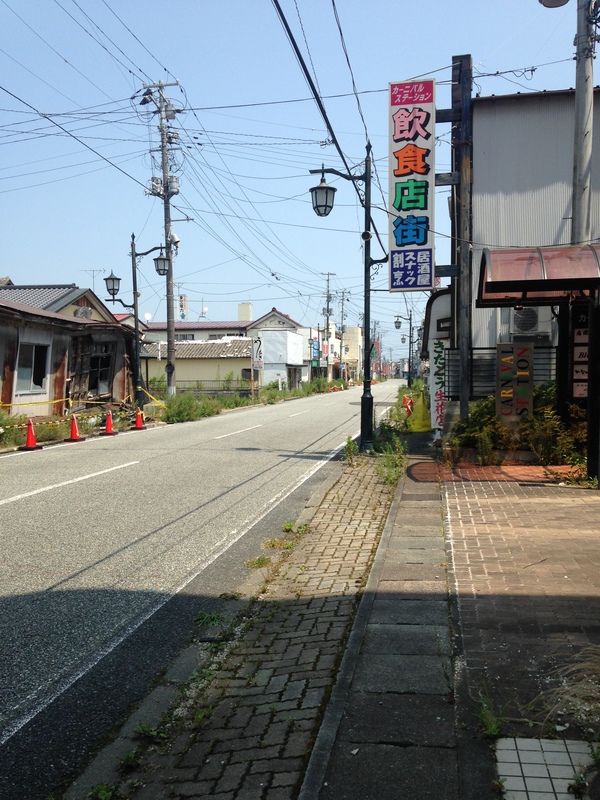 We drove to Namie next, a ghost town on the edge of the Red Zone, evacuated after the disaster. 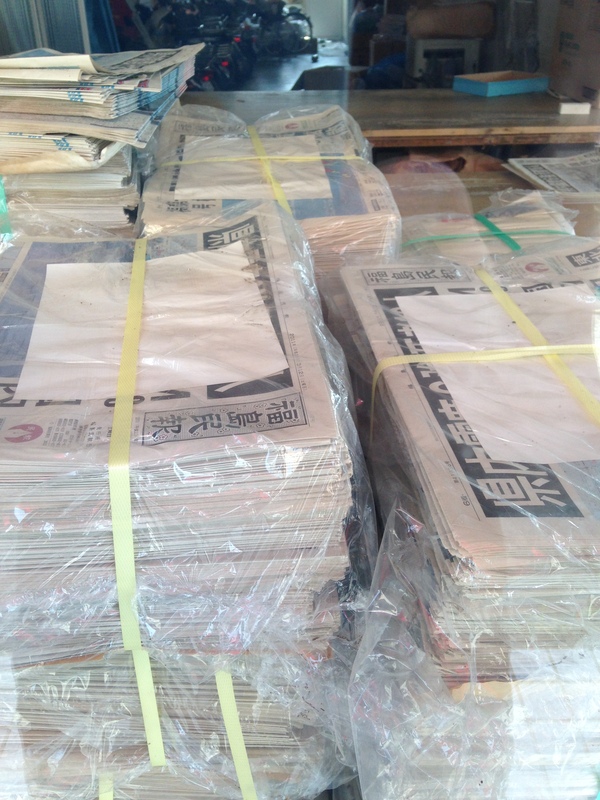 In a shop, piles of newspapers left from the day of the evacuation. Kyoko read the headlines for us – they were about the earthquake. 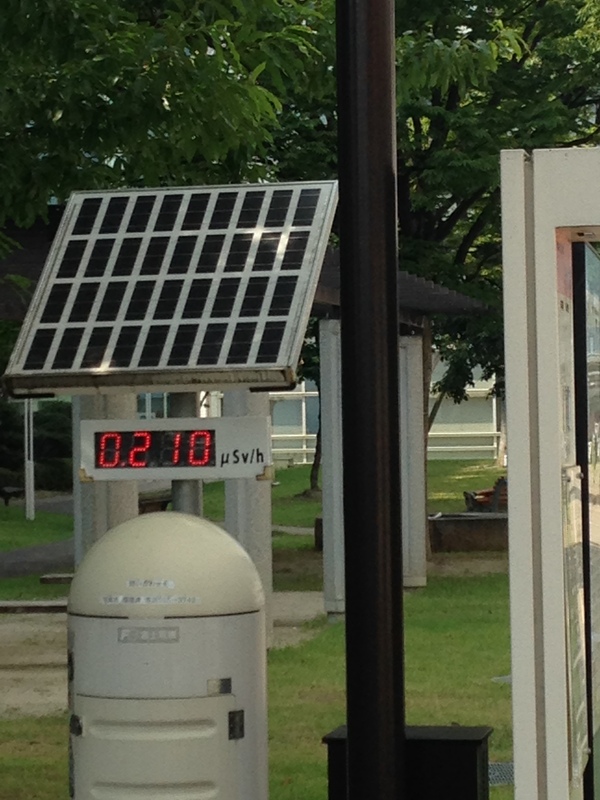 The Geiger counter reading increased and we decided to leave quite quickly to be on the safe side. We dropped Susan Schuppli off near where our guide’s house was, where she wanted more time to do some filming – I’d offered to drive back later to collect her – and we drove back to Soma. The others headed for Fukushima City from there, while I collected the small car I’d hired and drove the 90 minute journey back into the restricted zone to rendezvous with Susan. I found her filming in the middle of a field near a major seawall rebuilding project. We decide to drive back into Namie for a little more filming and, out of curiosity, we then headed to the edge of the Red Zone on Highway 6. It was the rush hour, and we looked on astonished at the endless stream of traffic emerging from the Red Zone carrying workers. 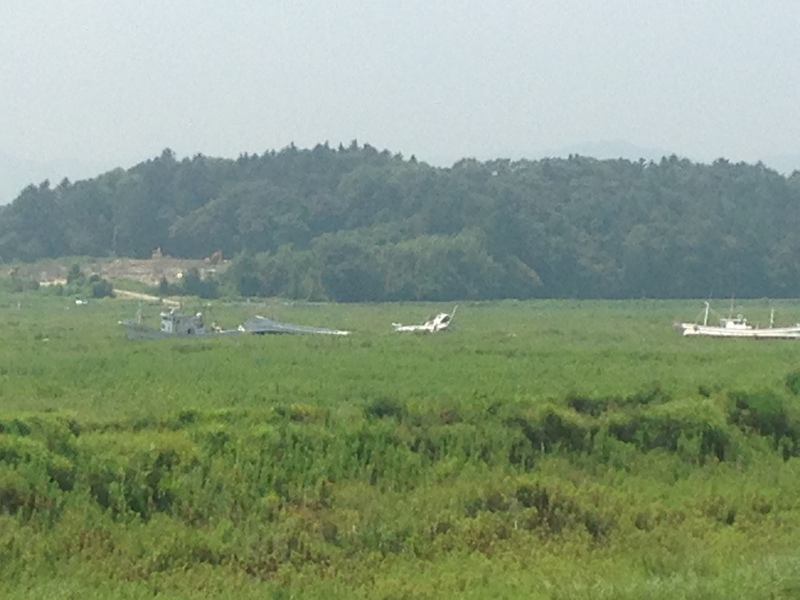 It was almost bumper to bumper driving back through Namie, but no one stops in this town. There are no shops open, yet it looks like a functioning town. It’s just that there’s no one here anymore. And probably never will be. We drove back to Fukushima City over the hills, skirting the edge of the Red Zone and passing through the deserted picturesque village of Iitate, an unfortunate place that was hit badly by the radiation despite being 40km from the power plant and outside the 30km exclusion zone around the plant. A feeling of great sadness and waste hit me, a sense of displaced people, disrupted lives and an invisibly toxic landscape.